Bauhaus Mural: The architecture of the site often defines style. 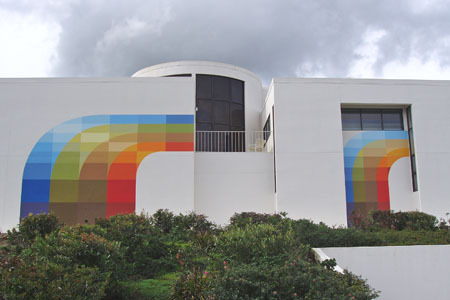 Client: Wanted to replace a dated 'super graphic' on the outside of headquarters in Palo Alto Hills. New design for exterior elevation is taking viewers from Page Mill Road in consideration. Mural can be viewed from close and far away. House has beeen nicknamed the Rainbow House by some of the Page Mill Road commuters.